This article is about a city in the Philippines. For other uses, see Cagayan (disambiguation). Cagayan de Oro, officially the City of Cagayan de Oro (Cebuano: Dakbayan sa Cagayan de Oro) or simply referred to as CDO, is a 1st class highly urbanized city in Northern Mindanao, Philippines. According to the 2015 census, it has a population of 675,950 people. It is a chartered city and capital of the province of Misamis Oriental where governance is independent and separate from the province. It also serves as the regional center and business hub of Northern Mindanao (Region X), and part of the growing Metropolitan Cagayan de Oro area, which includes the city of El Salvador, the towns of Opol, Alubijid, Laguindingan, Gitagum at the western side, and the towns of Tagoloan, Villanueva, Jasaan, Claveria at the eastern side. 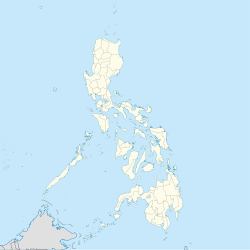 There are also other places in the Philippines with the Cagayan name; these include the province of Cagayan in northern Luzon, the Cagayan Islands in the northern Sulu Sea, and the island of Mapun in Tawi-Tawi (formerly known as Cagayan de Sulu). The Cagayan de Oro area was continuously inhabited by Late Neolithic to Iron Age Austronesian cultures. The oldest human remains discovered was from the Huluga Caves, once used as a burial place by the natives. A skullcap sent to the Scripps Institution of Oceanography in 1977 was dated to be from between 350-377 AD. The caves have yielded numerous artifacts, but most areas have been badly damaged by guano collectors and amateur treasure hunters. Associated with the cave is the Huluga Open Site, believed to be the site of the primary pre-colonial settlement in the region identified as "Himologan" by the first Spanish missionaries. The site is located about eight kilometers from present-day Cagayan de Oro. The discovery of a grave site in 2009 uncovered remains of Song Dynasty (960-1279 AD) celadon ware and Sukhothai period (1238–1347 AD) Sangkhalok ceramic ware, in addition to body ornaments and stone tools. It indicates that the region was part of the ancient maritime trading network of Southeast Asia. Skulls recovered from the sites show that native Kagay-anons practiced artificial cranial deformation since childhood as a mark of social status, similar to skulls from archeological sites in neighboring Butuan. The Huluga Open Site was damaged extensively in 2001 to give way to a bridge project by the local administration. It was the source of controversy when a team from the University of the Philippines-Archaeological Studies Program dismissed the archeological importance of the site by declaring it as a "camp-like area" and not a settlement and thus not worthy of heritage protection under the laws. It was alleged by local conservationists that the UP-ASP team were influenced by the local government so the bridge project could continue. The site is still not protected and continue to be quarried, despite protests by local historians and archeologists. The Himologan settlement was still occupied by the time the Europeans made contact. In 1622, two Spanish Augustinian Recollect missionaries reached the settlement and described it as being inhabited by a mixed stock descended from highlander Bukidnon Lumad and sea-faring Visayans ("Dumagat"). They described the men of the settlement as being tattooed like other Visayans and the women as being ornamented with intricate jewelry, some of which were golden. They also identified them as animists, practicing traditional anitism, though they paid tribute to Muhammad Kudarat, the sultan of the Islamized Sultanate of Maguindanao to the south. In 1626, Fray Agustín de San Pedro persuaded the chief of Himologan, Datu Salangsang, to transfer his settlement down the Cagayan River, to the present-day Gaston Park. De San Pedro later fortified the new settlement against Sultan Kudarat's raiders. The American forces attacking Makahambus, circa 1900s. May 3, 1942, American and Philippine forces fought heroically against invading Japanese forces from Panay. Unable to resist the overwhelming and the better supplied Japanese, the allied forces retreated to more defensive positions outside the city. The Japanese burned most of the city and took up residence at Ateneo De Cagayan university, now Xavier university and used the ferry crossing near San Agustin Church. The Carmen bridge did not exist at that time. The Japanese army implemented a scorch earth policy. Filipino and American guerrilla forces fought back during this occupation and American planes bombed both the university and San Agustin church on October 10, 1944. The Japanese were never able to successfully move outside the city for any length of time due to the constant pressure and attacks from the Philippine resistant movement. American and combined Free Philippine forces landed in Cagayan de Oro on May 10, 1945, three years and 7 days after the Japanese occupation. During this period the Japanese committed many atrocities against the local population of Cagayan de Oro, as they did throughout the Philippines. Colonel Fumio Suski and two hundred of his men escaped capture during the liberation of the city and withdrew into the mountainous jungle. They were caught two years later, only 38 had survived but when caught they had been cannibalizing the Higaonon tribal people. At least 70 people had been eaten. In 1950, the barrios of Opol, Igpit, and lower Iponan (now Barangay Barra) were separated from Cagayan de Oro to form the town of Opol. During the martial law era, Cagayan de Oro was not spared from military bombings and the usage of brutal mechanisms against dissenters of the Marcos regime. When martial law ended, more than a thousand people from the city were tortured, raped, electrocuted, or salvaged. Cagayan de Oro was then declared a highly urbanized city by the Ministry of Local Government on November 22, 1983. In 1986, the city participate in the People Power Revolution through rallies in the streets of the city. When the revolution succeeded and ousted Marcos from power in Manila, the city was among those who supported the installation of Corazon Aquino as president. In 1992, the National Museum of the Philippines recognized the archaeological value of Huluga when it gave the Open Site and caves separate accession numbers. In 1999, however, mayor Vicente Y. Emano conceived the plan to bulldoze Huluga to give way to a road-and-bridge project. The project was stopped in 2001, but was eventually continued in 2002. The construction destroyed at least 60% of the archaeological sites's open area, where the majority of artifacts can be found. Protests against the heritage destruction was made by cultural experts, but nothing happened with their plea. In 2003, the Heritage Conservation Advocates (HCA) went to the open area of Huluga for a scientific surface investigation and managed to find earthenware, Chinese pottery sherds, obsidian flakes, animal bones, an ancient Spanish coin, and a whale harpoon similar to those being used in Lomblen Island, Indonesia. The newly discovered artifacts proved that there are still many artifacts that can be found in the area. This caused the HCA to file a case against Emano and the contractor UKC Builders, before the Environmental Management Bureau (EMB). However, the construction continued and was inguarated in September 2003 by Emano. A day later, president Gloria Macapagal-Arroyo made a speech in UNESCO about her administration's gains in cultural conservation. In January 2004, the city council enacted an ordinance that authorized Emano to sign a contract with the Archaeological Studies Program (ASP) of the University of the Philippines to do salvage archaeology in Huluga and vicinities. The program did not make cooperitve linkages with existing archeological programs from Xavier University. The ASP declared that the site was an ancient camp, not a settlement, due to their findings in the destroyed archaeological site. The report did not consider the findings of Xavier University. The issue later climbed into the Philippine Senate, where Loren Legarda issued a resolution for investigation of the matter, but the investigation was never approved by the other members of the Senate. The artifacts found in the Huluga Caves and its destroyed open site from 1992 to 2003 are housed in Xavier University, Capitol University, and the University of the Philippines. On December 21, 2017, Typhoon Vinta (international name Tembin) impacted most of Mindanao. It made its landfall in the Davao Region. Three bridges were closed due to rising water levels in Cagayan de Oro, where 1,719 individuals were forced to evacuate. Roughly 30,000 people were either stranded in ports or stayed in evacuation centers while 22,000 people moved to higher grounds due to heavy flooding. NASA—satellite image captured of Macajalar Bay and the metropolis area. Roman Catholicism is the city's dominant religion, represented by almost 70 percent of the population. Other religious affiliations include the Seventh-day Adventist Church, Iglesia ni Cristo, the Philippine Independent Church, the United Church of Christ in the Philippines, Christ's Commission Fellowship, Baptists, the United Methodist Church, Jesus Miracle Crusade, and Islam which is increasing its number in the city since the Marawi Siege that started on the 23rd of May 2017, due to the migration of some families from Marawi City to other nearby cities including Iligan City and Cagayan de Oro City. The current archbishop in Cagayan de Oro is Most Reverend Antonio J. Ledesma, S.J., D.D. [clarification needed], who was installed on March 4, 2006, and his seat is located at St. Augustine Metropolitan Cathedral. Islam is practiced mainly by Maranao settlers and the Balik Islam members. There are several large mosques and about 50 small mosques that can be found in the city. Masjid Sharif Alawi in Barangay Balulang is the largest mosque in Northern Mindanao, with over 3,200 square meters in land area, which also includes a madrasa and seminar building. During Eid prayers, Pelaez Sports Complex is a known place for hosting the Salatul Eid. Cebuano is the primarily spoken language in the city. English is mainly used for business and in the academe. Maranao is widely spoken within the city's Maranao communities. Subanon and Hiligaynon are also spoken by their respective communities within the city. Cagayan de Oro is the regional center and logistics and business hub of Northern Mindanao. The city's economy is largely based on industry, commerce, trade, service and tourism. Investment in Cagayan de Oro City for the first six months of 2012 reached 7.4 billion pesos outpacing the local government's expectation of to nearly 100 percent. Investments in the city are dominated by malls, high-rise hotels and condominiums and convention centers. The net income for 2012 pegged at 2,041,036,807.89 billion pesos. Cagayan de Oro is home of the multi-billion peso fuel import facility of Pilipinas Shell Petroleum Corporation, dubbed as the North Mindanao Import Facility (NMIF). In 2012, the US Agency for International Development (USAID) chose Cagayan de Oro as one of three pilot areas in the country for its Cities Development Initiative. USAID's projects under the USAID’s Cities Development Initiative (CDI) are the Strengthening Urban Resilience for Growth with Equity (SURGE) project aims to help cities to plan better, create more attractive and competitive business environments, link urban and rural centers so that more citizens benefit from rapid economic activity, and provide adequate health and other basic social services; The INVEST Project, a three-year initiative of the USAID; Building Low Emission Alternatives to Develop Economic Resilience and Sustainability or B-LEADEARS project. Cagayan de Oro, as the regional economic center of Northern Mindanao, houses the Cagayan de Oro Branch of the Bangko Sentral ng Pilipinas (Central Bank of the Philippines). As of December 2017, at least 100 banks are operating in the city. Cagayan de Oro has been dubbed as the auto-hub in Mindanao as car brands like Toyota, Honda, Nissan, Isuzu, Mitsubishi, Suzuki, Ford, Kia, Foton, Mazda, Chevrolet, BMW, Peugeot, Hyundai, Subaru, Chery, Jinbei, Tata and Hino have set up dealerships in the city. Most of the car showrooms are located along the Iligan-Cagayan de Oro-Butuan Road. MAN has their CDO showroom at nearby town of Opol. Monark Equipment has one-hectare equipment yard in El Salvador, Misamis Oriental, which is just 16 minutes drive away from Cagayan de Oro. National and international companies have started building high-rise and mid-rise hotels and condominiums in Cagayan de Oro, such as Limketkai Luxe Hotel, Seda Hotel, New Dawn Pensionne, Centrio Tower and Aspira Towers under Avida Residences, Primavera Residences and Primavera City under ItalPinas Corp., The Loop under Vista Residences, MesaVerte Residences under Cebu Landmasters Inc (CLI), Tucania Towers, One Providence, One Oasis under Filinvest Land Inc.
Limketkai Center which has two shopping malls (Limketkai Mall & Robinsons CDO Mall) host many flagship tenants which include two Robinsons Supermarket branches (on both malls: one inside Limketkai Mall's South Concourse and another at the 2nd Floor of Robinsons CDO Mall), then there is also Shopwise Supermarket at the East Concourse, another Robinsons Supermarket stand-alone branch in Barangay Gusa, stand-alone department stores (Robinsons, SM, Gaisano and Ororama), two SM Malls (one at SM City Uptown and then the SM2 Downtown Premier), Ayala Centrio Malls (which host flagship tenants Rustan's Market & Robinsons Department Store), Gaisano City Malls, large grocery stores, 24-hour convenience stores (30 outlets of 7-Eleven, several local stores of Chams and Grams, Mercury Drug and Rose Pharmacy convenience stores) and two CityMall stores (one at Iponan and the other at Bulua, opened in the last quarter of 2018), offering local and imported products. Stores owned by local, national and foreign Chinese, Taiwanese, and Korean businessmen, are abounding in the City. Business process outsourcing (BPO) in Cagayan de Oro is booming due to ample supply of human capital supported by available health, research, educational, and modern telecommunication facilities. At present, business process operators in the city are Concentrix Corporation, Rider Livett Bucknall (RLB), Teleperformance, Azpired, Envizion, Arriba Telecontact Inc., Accolade Resources Inc., SupportZebra, Versatel and some BPO Web Development and Information Technology companies like Syntactics and Innovuze Solutions Inc. The increase of business process outsourcing companies in the city has led to new buildings and zones dedicated for contact centers. These new buildings are all PEZA registered. Cagayan de Oro is home to cooperatives which provide employment, economic assistance, and considered as one of the prime drivers of the City's economy. The Extension Office of Cooperative Development Authority of the Philippines, located in the City as the center of Northern Mindanao (Region X), provides technical advisory services, regulatory services, and online application processing. It is also the location of MASS-SPEC (the Cooperative Development Center, a federation of cooperatives in the Philippines). The big names of Cooperatives located in CDO are FICCO which has become a billionaire cooperative covering the entire of Mindanao, Oro Integrated Cooperative (constituting a development force of more than 100,000 strong members of farmers, fisherfolk, women, workers, vendors, drivers, government employees scattered in Cagayan de Oro and the provinces of Misamis Oriental, Bukidnon and Tagbilaran City who are now engaged in small and micro enterprises), ACDI Multipurpose Cooperative (preferred brand of Financial Services in the Armed Forces of the Philippines), Asian Business Cabletow Cooperative Academy (ABCCA), Inc. (provides access to and quality of education for the less-privileged students), CFI Community Cooperative, Coop-Life Mutual Benefit Services (CLIMBS, Life and General Insurance Cooperative owned by over 2000 cooperatives in the Philippines since 1971), Oro Savings & Sharing Cooperative, Cooperative Bank of Misamis Oriental (with 268 Cooperatives and Samahang Nayon as member-incorporators). RODELSA Hall, operated by Liceo de Cagayan University, serves as a center for the performing arts. Concerts of many genres have been performed at RODELSA. Cine Europa (films) featuring European Union's cultures which include Austria, Belgium, Bulgaria, Czech Republic, Denmark, Finland, France, Germany, Hungary, Italy, Netherlands, Norway, Poland, Romania were shown at RODELSA. Xavier Center for Culture and the Arts (XCCA), part of Xavier University - Ateneo de Cagayan, commissions and hosts culture and arts programs (Filipino and foreign, classical and contemporary). Cagayan de Oro has local, national, and foreign owned restaurants (Chinese and Korean cuisines), eateries, fast-foods, snack bars, bakeshops, and coffee shops that sprout all over the city. Sport venues include one of the biggest sports complex in Mindanao the Pelaez Memorial Sports Center, Xavier University-Ateneo de Cagayan Gymnasium, Liceo Civic Center, University of Science and Technology in Southern Philippine Gymnasium and others, a sports and entertainment complex that also hosts concerts. The Pelaez Memorial Sports Center serves as the home complex of Misamis Oriental sports teams. Cagayan de Oro's new indoor sport is go-karting. The Speed Master Go Kart Race Track at SM City Carpark Building was the first race track in the city and in Mindanao. F1 Go Karts will be the second facility of its kind in the city and the first to use electric cars. As the gateway to Northern Mindanao and the rest of Mindanao, Cagayan de Oro is accessible via land, air and water transportation. Main public transportation systems within the City are metered taxis, jeepneys with fixed routes, and motorelas within Poblacion. There are also a couple of river taxis that ply down to the Cagayan de Oro River for both locals and tourists. The Port of Cagayan de Oro in Macabalan is located near the estuary of the Cagayan de Oro River. It has an anchorage depth of 18 meters and is around 400 meters from the shoreline. It has four large gantry cranes and the biggest international and domestic seaport in Mindanao. It handled 1.399 million metric tons of cargoes during the first quarter of 2016 to rank 3rd in the country after Manila's North Harbor with 5.557 million metric tons and MICT with 3.746 million metric tons. The Port of Cagayan de Oro increased its volume of cargoes by 9.7% from 2015. This is according to data from the Philippine Ports Authority (PPA). Cagayan de Oro's Laguindingan Airport (CGY), declared recently as the 7th hub of Cebu Pacific Airlines, handles domestic flights to and from Manila, Cebu City, Iloilo City, Davao City, Bacolod, Zamboanga City, Dumaguete, Tagbilaran, and Clark in Angeles City. It sits on a 4.17 square kilometres (1.61 sq mi) site in Barangay Moog, Laguindingan, Misamis Oriental, some 46 kilometres (29 mi) northwest of Cagayan de Oro. The airport was inaugurated on January 11, 2006 by then President Gloria Macapagal-Arroyo, who advocated the idea of an international airport along the Cagayan de Oro-Iligan Corridor, and was officially opened on June 15, 2013. Laguindingan Airport is accessible by various modes of transportation provided by several transport operators from CDO and vice versa. These are ALPHAT Airport metered yellow taxi, regular metered taxi, and several shuttle express vans that run on an hourly basis (Magnum Express with its terminal at Limketkai Center, LAX Shuttle with its terminal at Ayala Centrio, Odyssey Airport Express with its terminal at SM CDO Downtown Premier, CAGATRANSCO, Glorymer Transport, Donsals Express, JTS, The Lord’s Transport Services, Europcar, Super 5, CDOTRANSCO, Numano Express). All have booths near the parking area at Laguindingan Airport. The Eastbound integrated Bus Terminal (Agora) also known as Market City offers regular landtrips to and from eastern municipalities of Misamis Oriental or eastern part of Mindanao including Balingoan and Gingoog, Carmen, Nasipit, Butuan (change buses travel to Surigao City), Bukidnon including Central or Southern portion of Mindanao such us Malaybalay and Valencia, Davao City, Kabacan, Tacurong and General Santos. Electricity in the city is provided mainly by Cagayan Electric Power and Light Company (CEPALCO) and partly by Misamis Oriental 1st Rural Electric Service Cooperative (MORESCO-1). Cagayan Electric Power and Light Company (CEPALCO). CEPALCO, which began operations in 1952, covers almost all of Cagayan de Oro and the Municipalities of Tagoloan, Villanueva and Jasaan, all in the Province of Misamis Oriental, including the 3,000-hectare PHIVIDEC Industrial Estate and caters to more than 100,000 consumers. The company's distribution system network includes 138,000 volt, 69,000 volt, 34,500 volt and 13,800 volt systems. CEPALCO's power supply is mainly coming from embedded power generators, namely: 165MW-Coal Power Plant of Minergy Power Corporation in Balingasag, 46MW-Diesel Power Plants of Minergy in Tablon, 8MW-Cabulig Hydro Electric Power Plant in Claveria, 7MW-Bubunawan Hydro Power Plant in Baungon-Libona, Bukidnon, 12.5MW Kirahon Solar Power Plant in Villanueva. CEPALCO is also operating the Developing World's first and largest (at the time of its inauguration in 2004) on-grid solar photovoltaic power plant. The 1-megawatt polycrystalline silicon-based photovoltaic (PV) plant in Barangay Indahag of this city is connected with the distribution network of CEPALCO. It is the biggest solar power plant connected to the power grid in Southeast Asia. Misamis Oriental -1 Rural Electric Service Cooperative (MORESCO-1) whose office is located in Laguindingan covers remote parts of Cagayan de Oro. These are barangays Canitoan, Pagatpat, San Simon, and Baikingon. Recently, PNP, AFP and spearheaded by LGU of Cagayan de Oro formed a new integrated security force of the city known as Task Force Oro. The local government of Cagayan de Oro upgraded its emergency services as it launched on Monday, October 30, 2017, dialing the 911 number will immediately link the call to CDRRMC. The city patterned its improved emergency response program after Davao City's Central 911 emergency call. CDO's 911 will utilize Computer-Aided Emergency response. Cagayan de Oro has a hospital bed-to-population ratio of 1:474 as of 2003. The Justiniano R. Borja General Hospital (a.k.a. City Hospital), the Camp Evangelista Station Hospital (Phil. Army), and Northern Mindanao Medical Center (formerly Provincial Hospital) are the three government-run hospitals. Capitol University Medical City, Polymedic General Hospital, Polymedic Medical Plaza, Maria Reyna–Xavier University Hospital, Cagayan de Oro Medical Center, Madonna and Child Hospital, Sabal Hospital, Puerto Community Hospital, and Maternity-Children's Hospital and Puericulture Center (formerly Oro Doctor's Hospital) are privately owned. A special medical facility for drug-abuse treatment and rehabilitation is the Department of Health-Treatment and Rehabilitation Center-Cagayan de Oro located at Upper Puerto, Barangay Puerto. The City has four major private universities/colleges: Capitol University, Liceo de Cagayan University, Lourdes College Cagayan de Oro, and Xavier University – Ateneo de Cagayan. The University of Science and Technology of Southern Philippines is the only state university in the city. Other higher education institutions include Southern Philippines College, Pilgrim Christian College, Cagayan de Oro College, St. Mary's Academy of Carmen run by the RVM Sisters, Informatics Computer Institute and STI College - Cagayan de Oro with a secondary education program in Barangay Kauswagan. There are also a number of foreign schools in the city with study programs. In local television, famous local produced shows were from ABS-CBN TV-2 Cagayan de Oro that broadcast not only in the city but it reach whole Northern Mindanao and even Southern Bohol and Caraga region. Morning show like Pamahaw Espesyal and Local news program- TV Patrol North Mindanao. Also, GMA Northern Mindanao contributed to local flagship news program One Mindanao (simulcast over GMA Davao) that broadcast in the whole Mindanao. The seal of Cagayan de Oro when it attained its cityhood in 1950 and was replaced in 1976. Further replacements in the seal occurred in 1990 and 2000. In 2014, the 1990 seal was used again. Local history conservation advocates contested the restoration of 1990 seal for official use, as it is not protected under Republic Act 8491. The 1950 seal is the only one recognized by NHCP and legally protected by the said law. ^ "Cagayan de Oro: The City with Golden Opportunities". Philippine Statistics Authority. Archived from the original on 1 August 2017. Retrieved 15 April 2019. ^ "Whitewater Rafting Adventure". City Government of Cagayan de Oro. Archived from the original on 5 August 2016. Retrieved 15 April 2019. ^ Daily, Mindanao Goldstar (10 January 2019). "Brightest prospects for the 'City of Gold'". Mindanao Gold Star Daily. Archived from the original on 15 April 2019. Retrieved 15 April 2019. ^ a b Montalvan, Antonio J. II (October 16, 2009). "History of Cagayan de Oro". Heritage Conservation Advocates. p. 2. Retrieved September 13, 2012. ^ Dizon, Eusebio Z.; Pawlik, Alfred F. (September 2010). "The lower Palaeolithic record in the Philippines". Quaternary International. 223-224: 444–450. doi:10.1016/j.quaint.2009.10.002. ^ a b Ostique, Lourd. "Huluga Chronology". Heritage Conservation Advocates. Museo de Oro, Xavier University. Retrieved 30 December 2018. ^ Montalvan, Antonio J., II. "New Archaeological Site Discovered in Cagayan de Oro". Heritage Conservation Advocates. Retrieved 30 December 2018. ^ Elizaga, Elson. "Dr. Erlinda M. Burton". Mindanao Goldstar Daily (15 October 2018). Retrieved 30 December 2018. ^ Gomez, Herbie S. (5 July 2003). "Builders, Archaelogists Clash in Cagayan de Oro: Development vs Cultural Heritage". Bulatlat. Retrieved 30 December 2018. ^ Hernandez, Vito (2011). "Using International Heritage Charters in Philippine Cultural Resource Management". In Miksic, John N.; Goh, Geok Yian; O'Connor, Sue (eds.). Rethinking Cultural Resource Management in Southeast Asia: Preservation, Development, and Neglect. Anthem Press. p. 181. ISBN 9780857283894. ^ "Unsung Heroes of the Philippine Revolution: Ang mga Pilipino sa Ating Kasaysayan, a Centennial Resource Book". MSC Institute of Technology. Retrieved September 13, 2012. ^ Berlow, Alan (July 4, 1996). "The Independence Day That Wasn't". Philippine Centennial Series. Philippine History Group of Los Angeles. Archived from the original on August 28, 2012. Retrieved September 13, 2012. ^ The 1st Congress of the Philippines (June 15, 1948). "R.A. No. 268, An Act Creating the Municipality of El Salvador, Province of Misamis Oriental". Philippine Law Info. Archived from the original on March 24, 2012. Retrieved April 8, 2011. ^ The 2nd Congress of the Philippines (June 15, 1950). "R.A. No. 524, An Act Creating the Municipality of Opol, Province of Misamis Oriental". Philippine Law Info. Archived from the original on April 6, 2012. Retrieved April 9, 2011. ^ The 2nd Congress of the Philippines (June 15, 1950). "R.A. No. 521, Cagayan de Oro City Charter". Philippine Law Info. Archived from the original on August 1, 2012. Retrieved September 13, 2012. ^ Roa, A. Paulita (June 15, 2012). "The City of Cagayan de Oro". Feature. Sun.Star Cagayan de Oro. Retrieved September 13, 2012. ^ Ressa, Maria (December 19, 2011). "Storm death toll tops 650 in Philippines; hundreds missing". Asia. CNN. Retrieved September 13, 2012. ^ "Death toll from Typhoon Bopha tops 1,000 in the Philippines - CNN.com". CNN. Retrieved 2015-08-06. ^ Lagsa, Bobby. "Thousands stranded as flash floods hit Cagayan de Oro". Rappler. Retrieved January 19, 2017. ^ "4 dead, 1 missing, thousands displaced in Oro flood". SunStar Cagayan de Oro. Retrieved January 19, 2017. ^ Jerusalem, JIgger; Saliring, Alwen; Viguella, Abigail. "Heavy rains cause worst flooding in Oro since Sendong". SunStar Cagayan de Oro. Retrieved January 19, 2017. ^ "The Official Website of Cagayan de Oro City". The City Government of Cagayan de Oro City. Retrieved September 13, 2012. ^ "Cagayan de Oro City: Population growth rate declined to 1.63 percent". Philippine Statistics Authority. September 17, 2002. Archived from the original on February 21, 2012. Retrieved September 13, 2012. ^ "Cagayan de Oro". Philippine Airlines. Retrieved September 13, 2012. ^ "Fuel import facility in Mindanao". Pilipinas Shell. ^ "Kagay-an Festival". CDO Guide: Your Online Guide to Cagayan de Oro. Retrieved September 13, 2012. ^ "Cagayan de Oro Carnival Parade". ACadeO:What To Do in Cagayan de Oro. Retrieved November 3, 2015. ^ "Port of Cagayan de Oro". Philippine Ports Authority. Archived from the original on July 28, 2010. Retrieved September 13, 2012. ^ Rodriguez, Ma. Cecilia (July 22, 2007). "Waiting for the flight from Laguindingan". Inquirer Headlines - Regions. Inquirer Mobile. Archived from the original on September 26, 2013. Retrieved September 13, 2012. ^ Cabahug-Aguhob, Rutchie (December 14, 2009). "Pres. Arroyo inaugurates 17,000th km-milestone FMR" (Press release). Philippine Information Agency. Retrieved September 13, 2012. ^ "CEPALCO'S 1MWP Photovoltaic Power Plant". Cagayan Electric Power and Light Company'. Archived from the original on September 1, 2012. Retrieved September 13, 2012. ^ The 14th Congress of the Philippines (January 7, 2009). "R.A. No. 9519, Mindanao University of Science and Technology Charter". Philippine Law Info. Retrieved September 13, 2012. ^ "Officials in Cagayan de Oro City". Elizaga. Archived from the original on November 2, 2012. Retrieved September 13, 2012. ^ "South Bay Facts". Los Angeles Times. July 31, 1986. Retrieved September 13, 2012. ^ "Minutes of the Lawndele City Council Regular Meeting" (PDF). City Government of Lawndale City. December 19, 2011. p. 8. Archived from the original (PDF) on August 29, 2012. Retrieved September 13, 2012. ^ Elson T. Elizaga Neglecting Our Ancient City , Letter. Wikimedia Commons has media related to Cagayan de Oro City. Wikivoyage has a travel guide for Cagayan de Oro.